Petite in size, magnificent in coverage; our range of 6.5 to 7.5 ft patio umbrellas will keep you covered in style! 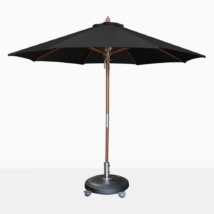 Teak Warehouse is proud to bring you a collection of luxury umbrellas in different sizes, shapes and colors. 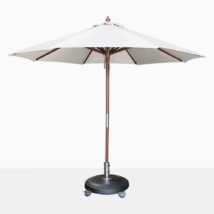 Our smallest models are perfect for café style dining tables or over a relaxing chair on the porch. Choose from modern, sleek designs or tasteful and traditional options! Is your sunny nook in the garden just asking for you to curl up with a book and relax! 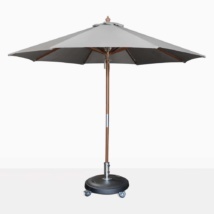 Start with a low lying chair such as our Tokio Relaxing Chair, place a side table beside and make sure your shelter with a 7.5 Sunbrella Round Umbrella in charming Grey, place it in a Small Round Concrete Base and voila! You have created an alluring, appealing area to call your own! Large pool area that needs shade for your gorgeous sun loungers? 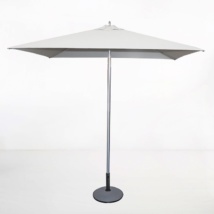 Line up the Square Olefin Market Umbrellas in pure White for a chic and stylish look as you enjoy the warmth of the sun. Teak Warehouse has an incredible range of garden furniture to suit all tastes! As well as the beautiful umbrellas shown here, we have many different deep seating collections, furniture for the poolside, bar, and, of course, dining! Everything we do, we make to outdoor specifications, because we want to make sure that your furniture stands the test of time! 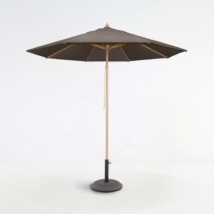 Our materials include A Grade Teak, Outdoor Wicker, rustic Raw Concrete, Reclaimed Teak, Resin, Metal, Sunbrella® and Batyline® mesh products, because we know quality is key. Our 6.5ft to 7.5ft Umbrellas may be small, but they pack a perfect punch! 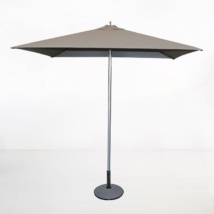 Call Teak Warehouse to discuss these umbrellas and your outdoor furniture needs! We can prepare you a comprehensive quotes, take you through care instructions and organize delivery!